Do you need to… talk tactical? 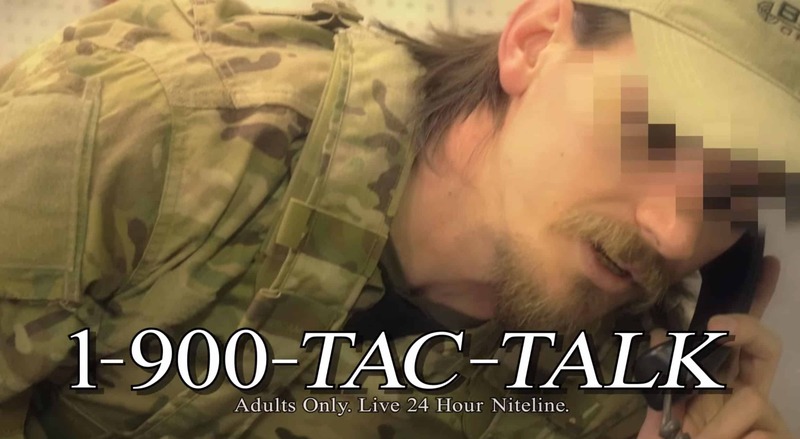 If you just can’t get that new Colt 1911 out of your mind, then call 1-900-TAC-TALK to start a tactical conversation with combat hardened operators right now, one on one. If you’re not into tactical gear, then this video may be very confusing for you. Like any obsession, people that are into tactical gear just can’t help but talk about it at every opportunity – usually using lingo and terminology that’s completely incomprehensible to people not in the know. I admit, I’m kind of into tactical gear. I’m not one of those people that owns a thousand knives or flashlights, but I do like so-called “tactical” qualities in the garments I own. Military inspired = better… right? When I see a pair of pants specially designed with a crotch gusset for maximum range of movement, I get a special feeling between my legs. No, not like that you disgusting pervert; I’m talking about freedom! My tactical equipment calling out, finally able to move with grace and precision as I carry out my daily missions around the house office.